We all know how post-apocalyptic narratives work, right? We’ve seen the films, read the books, watched the TV shows. It’s a genre that only seems to get more popular – a reaction, perhaps, to a world that is itself beginning to look pretty damn apocalyptic. North Country, though, challenges the post-apocalypse that we know and love to dread. There are familiar tropes – disease, riots, stockpiling canned food – but set in a different frame. For a start, the global catastrophe imagined by Tajinder Singh Hayer is in the very, very near future: his fictional plague takes grip on 5th November 2016, the final date of this production’s run. There’s no doubt that we’re meant to feel our uncomfortable proximity to these events. But the more striking contrast is in whose stories we hear. As was made painfully clear again recently by Tim Burton’s pitiful defence of his casting practices, the genres of sci-fi, fantasy and horror are whiter than white (and if a non-white character does get a look in, they’re usually the baddie). There are lots of reasons why we should want to change this, but Hayer sets out one of the most compelling in the preface to his play: if people of colour are excluded from sci-fi, then they’re excluded from imaginings of the future. In this imagining of the future, then, British Asian experiences are central to the aftermath of disaster. As worldwide plague rapidly decimates most of the human population, three Bradford teenagers – Harvinder, Nusrat and Alleyne – find different ways to survive. Harvinder falteringly picks up the medicine practised by his parents; Nusrat forges alliances and makes deals; Alleyne capitalises on his father’s farm and the vital resource of food that it provides. Spanning more than forty years, the play follows a fraught and halting process of healing. Without the separating veil of screen or page, North Country cannily trades on its nearness – both physically and thematically. 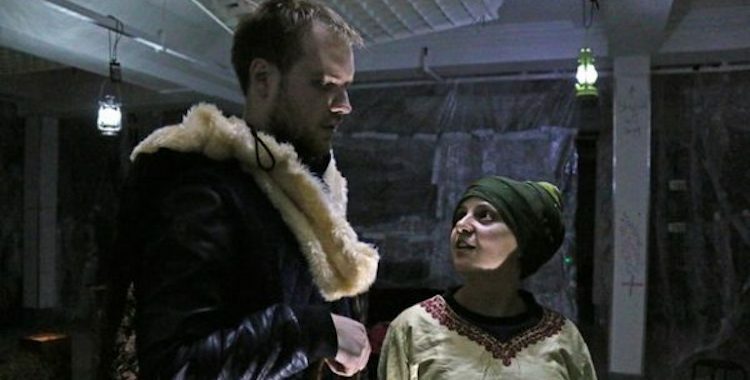 It’s staged in the shell of an old M&S in Bradford city centre, a venue suggestive not just of the abandoned buildings of a plague-ravaged world but also of the empty spaces created by a financial apocalypse-of-sorts much closer to home. Huddled around the edges of the makeshift auditorium, we’re right up next to the characters in Alex Chisholm’s production, almost as if we too are in one of the survivors’ camps. Plague aside, in many ways the play feels unsettlingly close to present events. As illness and panic first break out, immigrant communities become a convenient scapegoat (you can almost imagine the Daily Mail headlines). Quickly, Harvinder and Nusrat are at risk not just from disease, but also from their fellow citizens. And in the fractured communities that begin to emerge once infection has subsided, race becomes a clear dividing line, with white farmer Alleyne at the head of one tribe and Nusrat leading another, in uneasy alliance. As with all versions of the apocalypse, North Country is very much a product of its moment. There’s plenty to chew over, even if the expression of Hayer’s ideas is not always as interesting as those ideas themselves. With so much happening in just an hour and a bit of performance time, clarity and pacing become issues. There are moments when the confusion is apt – like when we’re plunged into the darkness of a world in which fuel and hope are running out. At other times, though, important plot points or character details race by. There’s so much here about the difficult process of forging new identities, but without the time and space to really know these characters. The form of the play also brings its challenges. While the three protagonists cross paths at crucial moments, much of the narrative is conveyed through intercut monologues, meaning that the majority of the action is told rather than shown. Chisholm does her best to move the actors around the space and keep the performance dynamic, but at times it can feel like a relentless stream of words and information. Post-apocalyptic fiction is a genre that’s all about thrill and peril, but North Country struggles to quicken the pulse. For all its flaws, though, it feels important that this is being staged, and particularly that it is being staged now. There’s a line that sticks: “someone looking for a face to blame”. It’s not as though racism emerged overnight after the EU referendum result, but it does feel – terrifyingly – like more and more people are actively and violently “looking for a face to blame”. Hayer’s visions of British Asians being sought out and beaten by those feeling robbed of their lives are not a great leap of the imagination. There is hope, though. Hayer sees the post-apocalyptic genre as mirroring the migrant narrative: it’s all about finding a new way of being, a new identity in a new world, while the past lingers indelibly in the transformed present. And it’s a genre that reveals the resilience and adaptability of human beings and the possibility, in spite of all the horror, for people to find new ways of living alongside one another. Above all, North Country is about what sort of collective identity we want to create – a question that, since the morning of 24th June, seems more pertinent than ever.